"The dips found by Kepler are real. Something seems to be transiting in front of this star and we still have no idea what it is!" said German astronomer Michael Hippke this past May. Even if aliens are not involved, Tabby's star remains "the most mysterious star in the universe" as Yale astronomer Tabetha Boyajian described KIC 8462852, popularly known as Tabby's star. Now, new research led by Huan Meng, an astronomer at the University of Arizona concludes that a microscopic dust ring originating from circumstellar material found in the star system is causing the dimming and brightening exhibited by KIC 8462852. “It cannot be anything from the interstellar medium,” says Meng — meaning the object(s) at the focus of this investigation is definitely within the planetary system of Tabby’s star. Media interest went viral in October of 2016 when a group of astronomers from Pennsylvania State University released a preprint that cited KIC 8462852's "bizarre light curve" as "consistent with" a swarm of alien-constructed megastructures. Public interest in the star, which sits about 1,480 light-years away in the constellation Cygnus, began when Boyajian and colleagues posted a paper on an astronomy preprint server reporting that "planet hunters" – a citizen science group formed to search data from the Kepler space telescope for evidence of exoplanets – had found unusual fluctuations in the light coming from the otherwise ordinary F-type star (slightly larger and hotter than the sun). 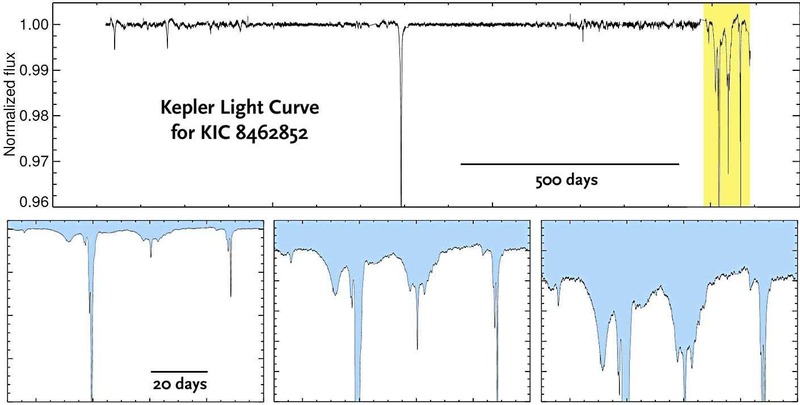 The top panel of the graphic below shows four years of Kepler observations of the 12th-magnitude star KIC 8462852 in Cygnus. Several sporadic dips in its light output (normalized to 100%) hint that something is partially blocking its light. The portion highlighted in yellow, recorded in February to April 2013, is shown at three different scales along the bottom. The random, irregular shape of each dip could not be caused by a transiting exoplanet. (T. Boyajian & others / MNRAS). The attention caused scientists at the SETI Institute to train its Allen Telescope Array on the star to see if they could detect any radio signals indicating the presence of an alien civilization. In November it reported finding "no such evidence" of signals with an artificial origin. Fast forward to today's latest study That’s still the case with these latest findings. “What we do not know, is what caused this phenomenon,” says Meng, lead author of of the new observations in an interview with Inverse.com detailing the results made with a pair of space telescopes “eliminates the possibility of an alien megastructure” orbiting KIC 8462852. Meng and his team have submitted their paper to Astrophysical Journal, where it has already gone through peer review and been accepted for publication. In this latest study, Meng and his colleagues including Boyajin collected observational data from October 2015 to March 2017 of KIC 8462852 using two more NASA space telescopes: Swift, which is able to make X-ray and ultraviolet (UV) light measurements; and Spitzer, which can measure objects in infrared (IR). These observations essentially add two more dimensions to the Kepler data, which is monochromatic. But more importantly according to Inverse, Meng and his team found that the dimming rates between UV and IR differed significantly. The distinction suggested, “micro-sized dust screens” are the culprit behind the irregular dimming observations. “Only microscopic fine-dust screens are able to scatter the starlight” in the way characterized by measurements, says Meng. Meng adds that NASA is preparing its own announcement of the findings within the coming weeks. 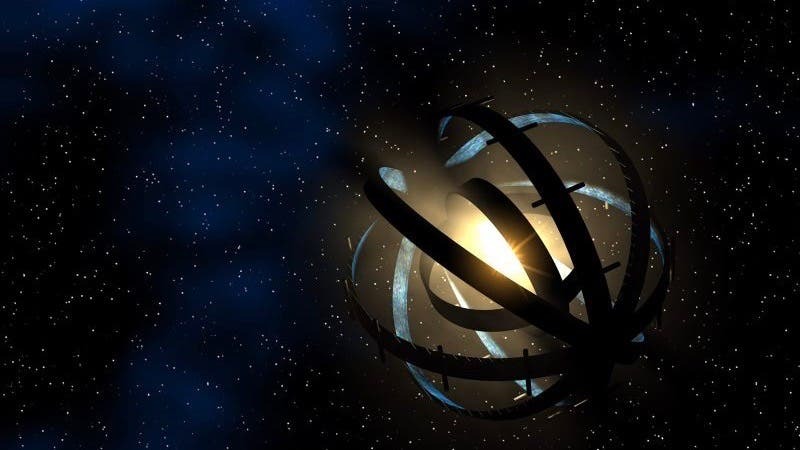 Image credit: An artist’s concept of a Dyson sphere. Image via CapnHack, via energyphysics.wikispaces.com.